Denver Broncos vs. San Diego Chargers Thursday Night Football Prediction & Free Pick – October 13, 2016 at 8:25 PM EST. The Denver Broncos will take on the San Diego Chargers at Qualcomm Stadium in a key AFC West showdown here in Week 6. The San Diego Chargers are in dire need of a victory after a brutal 1-4 start to the season, but it sure won’t come easy against the 4-1 Broncos who are looking to get back in the win column coming off their first defeat of the season. Denver opened as a 2.5-point favorite but Broncos backers have to give the full field goal to back the visitors against the spread as of the publication of this Broncos vs. Chargers Thursday Night Football prediction. That is completely in line with both the public perception and the sharp money with close to 70 percent of the wagers at top sportsbooks in Vegas coming in on Denver. The total is holding steady at 45.5 points with slightly more tickets backing the over than the under. The Broncos are coming off a 23-16 setback as a 3.5-point home favorite against the Falcons last week. Denver failed to exploit the Falcons’ 30th-ranked defense, but keep in mind that starting quarterback Trevor Siemian missed the game with a shoulder injury. All signs point towards Siemian being back behind center for Thursday’s clash, and his presence should take some of San Diego’s D’s attention away from C.J. Anderson. Anderson mustered just three carries longer than four yards last week, and now he’ll have to take on the league’s eighth-best rushing defense. The Chargers have had a lot of brutal beats already this season and they suffered another one last week in a 34-31 setback to Oakland where they held the lead for 58 minutes only to oome up short when it really mattered. They have played better than their 1-4 record would suggest though. 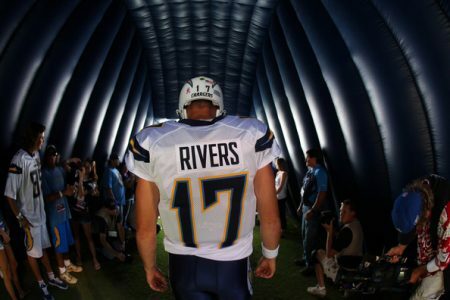 San Diego has the league’s second-ranked offense at 30.4 points per game and QB Phillip Rivers is NFL fourth-best with 1,469 passing yards. He has thrown for 11 touchdowns while getting picked off three times. Over is 4-1 in Broncos last 5 Thursday games. Over is 6-0 in Broncos last 6 games in Week 6. Under is 4-1 in Broncos last 5 road games vs. a team with a losing home record. Under is 3-1-1 in Broncos last 5 games after accumulating less than 90 yards rushing in their previous game. Under is 5-2-1 in Chargers last 8 Thursday games. Over is 5-0 in Chargers last 5 games following a straight up loss. Under is 8-1 in Chargers last 9 home games vs. a team with a winning road record. Under is 5-1 in the last 6 meetings in San Diego. The Broncos are not clicking on the offensive side of the ball right now and the Chargers are guaranteed to go after their banged up QB. You can always count on Denver’s D though, and we think this game will stay under the set total.